Obverse: The design shows a portrait of President John Fitzgerald Kennedy, the youngest person ever elected to the office. U.S. Mint Sculptor–Engraver Gilroy Roberts based this profile on a portrait prepared for Kennedy’s presidential medal. Roberts created his original 1964 design shortly after Kennedy's assassination. Reverse: The design is based on the Presidential Seal and was done by U.S. Mint Sculptor–Engraver Frank Gasparro. It consists of a heraldic eagle with a shield on its breast, holding a symbolic olive branch and a bundle of 13 arrows. A ring of 50 stars surrounds the design, which gives this coin the distinction of having more stars than any other United States coin ever produced for circulation. To celebrate the 50th anniversary of the series, the United States Mint offered three special products incorporating 2014 Kennedy Half Dollars from a different mint facilities and across a variety of finishes. The specially issued coins featured the original obverse portrait of President Kennedy designed by Gilroy Roberts. During the year, standard versions of the half dollar were also released bearing the modern portrait design. Over the years, the design of the Kennedy Half Dollar had undergone a series of tweaks and modifications that left the modern appearance very different than the original. The idea to restore the original portrait was first suggested by San Francisco Mint employee Michael Levin and would be implemented for the 50th anniversary of the series. The obverse portrait was restored by scanning and digitizing a bronze galvano and an original die from the 1964 Kennedy Half Dollar and creating a new basin from the 1964 hub basin curvature. The restored obverse portrait would be used across seven different coins included in three different 50th anniversary products. The two-coin Uncirculated Coin Set included standard composition half dollars from the Philadelphia and Denver Mints with an uncirculated finish. The four-coin Silver Coin Collection included 90% silver half dollars from four different mint facilities with four different finishes. A three-quarter ounce 24 karat gold proof coin struck at the West Point Mint was also available. Prior to the release of the special anniversary products, the US Mint had offered the standard product offerings for the including 2014 Kennedy Half Dollars with the regular modern obverse portrait. Two roll sets and 200-coin bags containing circulating quality half dollars from the Philadelphia and Denver Mint went on sale February 13, 2014. These were priced at $32.95 per two roll set and $139.95 per 200-coin bag. 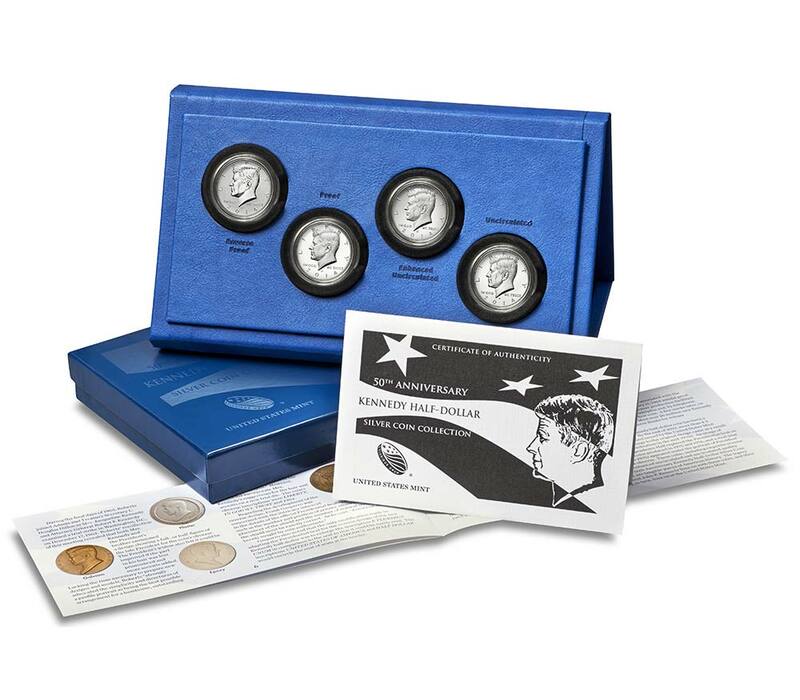 The annual sets issued for the year contained the 2014-S Proof Kennedy Half Dollars with the modern portrait. The standard composition proof coins were included in the 2014 Proof Set as well as other 2014 celebration sets. The 90% proof composition coins were included within the 2014 Silver Proof Set and the 2014 Limited Edition Silver Proof Set, which was actually released in 2015. Lastly, uncirculated quality half dollars with the modern portrait were included within the 2014 Uncirculated Coin Set. These coins feature a superior finish to the circulating quality examples released in bags and rolls, but are not typically identified as a separate issue. The Kennedy Half Dollar continued to be produced exclusively for coin collectors and not released for general circulation during the era from 2010 to present. There would be some excitement in 2014 when special products were issued to mark the 50th anniversary of the series. The standard offerings for the half dollar had consisted of circulating quality coins packaged in numismatic bags and rolls. Collectors could purchase the coins directly from the United States Mint at a modest premium to face value. Mintage levels remained low since the coins were only produced in the amount needed to satisfy collector demand. Additional numismatic versions of the Kennedy Half Dollar included the standard composition proof as well as a 90% silver proof struck at the San Francisco Mint and carrying the “S” mint mark. Traditionally, these coins were only available within the annual Proof Set and Mint Set. In some years, additional annual sets would incorporate the coins. In 2014, the Mint offered three special products to celebrate the 50th anniversary of the series. Each of the products contained coins exclusive to the sets, in standard copper-nickel clad, 90% silver, and 24 karat gold compositions. These products also marked the restoration of the original portrait design by Gilroy Roberts.